NIH3T3 cells; COLO, HT29, A549 and 293 cell extracts; human breast carcinoma tissue. Our Abpromise guarantee covers the use of ab79277 in the following tested applications. WB 1/500 - 1/1000. Predicted molecular weight: 47 kDa. Ubiquitous. Highest levels in heart, liver, skeletal muscle and ovary; lowest levels in brain, lung and kidney. Also found in B-cells, T-cells and endothelial cells. 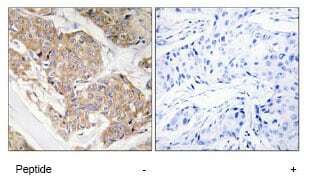 ab79277 at 1/50 dilution staining IL-13 receptor alpha 1 in human breast carcinoma by Immunohistochemistry using paraffin-embedded tissue, in the absence or presence of the immunising peptide. 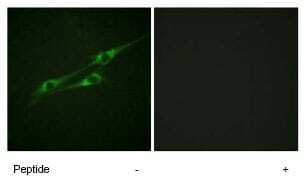 ab79277 at 1/500 dilution staining IL-13 receptor alpha 1 in NIH3T3 cells by Immunofluorescence, in the absence or presence of the immunising peptide. Publishing research using ab79277? Please let us know so that we can cite the reference in this datasheet. Thank you for confirming these details and for your cooperation. I am sorry this product did not perform as stated on the datasheet and for the inconvenience this has caused. 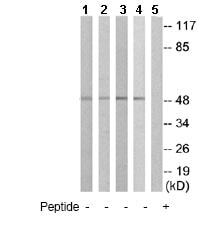 As requested, I have issued a free of charge replacement with one unit of anti-IL13 receptor alpha 1 ab79277. The order number is ********. To check the status of the order please contact our Customer Service team and reference this number. Please note that this free of charge replacement vial is also covered by our Abpromise guarantee. Should you still be experiencing difficulties, or if you have any further questions, please do not hesitate to let us know. I wish you the best of luck with your research.